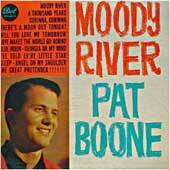 "Moody River" is a song released in May 1961, which was performed by Pat Boone. It reached number-one on the Billboard Hot 100 chart the following month. It was written by and originally performed by country rockabilly singer Chase Webster (real name Gary Daniel Bruce, not to be confused with Gary Bruce of the Knack). Webster was a labelmate of Boone's at Dot Records. This was the title track from one of Boone's better-selling albums. Boone sang this song as if he were in pain. It was covered some years later by Johnny Burnette in 1962, also Frank Sinatra and Johnny Rivers. In August 2009, John Fogerty covered the song in the album entitled The Blue Ridge Rangers Rides Again. The song tells the story of a man who goes to meet his love at the river, by the old oak tree, and finds that she has committed suicide. A note on the riverbank explains that she has cheated on him and that "No longer can I live with this hurt and this sin. I just couldn't tell you that guy was just a friend." He then looks into the river and sees his own reflection on the river looking back, ever hauntingly, at him. He is the "lonely, lonely face just lookin' back at me". So with "Tears in his eyes, and a prayer on his lips, and the glove of his lost love, at his fingertips". This page was last edited on 19 February 2019, at 05:26 (UTC).